RailsConf 2010 was this past week in Baltimore, MD. I decided to make the trip down from CT since it was only about 5 hours by train. Many people have already covered the conference around the interwebs and I am not doing it here. I had a great time, meeting many new friends and catching up with some old ones. 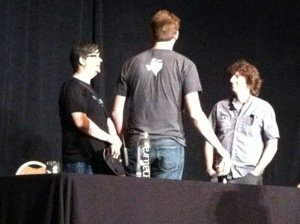 I arrived on Sunday evening and attended the Ignite RailsConf event. This event had excellent content and was well attended with about 200 people coming out. Monday came and we had a full schedule of 3-hour tutorial sessions. These were good but the unfortunate thing about multi-track events is missing some sessions I would like to see. It appears the keynotes were the only sessions being recorded, which is too bad. The keynotes were really one of the highlights of the event for me. I get the most out of these as they are typically by members of the software development community which are not necessarily Ruby or Rails related. The exception here was really Gary Vaynerchuck, which I missed because I was traveling home. Thankfully, O’Reilly was recording these sessions and I can watch when I have the time. 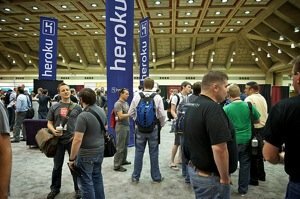 Anyone who did not attend RailsConf should check out the recorded keynote sessions from DHH, Yehuda Katz, Derek Sivers, Robert Martin, Gary Vaynerchuck, Michael Feather, Neal Ford and Evan Phoenix. The sessions were overall pretty good and I enjoyed the ones I attended, but I wish I could see other sessions than just the ones I attended. I think we should petition O’Reilly to record all talks. Attending all these sessions during the week were really exhausting. As I write this on Saturday I still feel tired and imagine I won’t feel rested for a few days. I have come to learn that the real value of any conference is not the knowledge acquired while attending the sessions but the friends and acquaintances we see and the new relationships formed. I met many people who I knew only from the online world, interacting on my blog or Twitter. I was fun to see how the people looked different than their Twitter pictures, many look very different. I did have a good time at RailsConf but it was exhausting. As I write this today I am still really tired from the 5 days I was away. I find it interesting how people take in a conference, how they spend their time. As I attended talks I looked around the room to see a sea of Apple logos of the MacBooks in the audience. I noticed people with their MacBooks spending the session writing code, surfing the web or using Twittering. I repeatedly wondered why people make the effort to attend a session yet do something other than pay attention to the speaker. I have been to both large and small conferences and especially after this RailsConf, I keep think that smaller single track conferences are the way to go if you want the chance to have a richer environment. I missed several people I wanted to meet but never ran into them, which goes to show the size of the group. Smaller conferences typically have 100-200 people and gives attendees a better chance of seeing everyone. 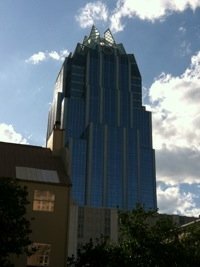 I am looking forward to attending more computer science and engineering related conferences this year as well as some business-specific ones such as BizConf. I think these are the types of conferences I will gain more value from, rather than simply Ruby-specific. I hope to see you at a conference soon.